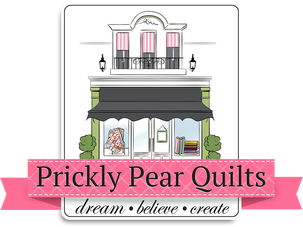 Prickly Pear Quilts offers new, fun-filled classes quarterly! We invite you to join us. Join Connie and learn to sew with knit fabric while making this fun and fast soft knit baby hat. The pattern includes sizes Preemie up to 12 Months. This cute little baby cap is made out of soft knit fabric and comes with a fitted top and a cuff that can be rolled up for more cuteness! Learn how to paper piece with this very simple project where you can feature your favorite photo and place in the opening and change the photo as often as you would like. Starting on September 5, from 11am-3pm or 5pm-9pm Join us for a fun, FREE sew along and create the farm girl vintage quilt. We will sew all of the 45 Farm Girl blocks from the Farm Girl Vintage book. Every other Wednesday we will sew two 6" blocks, with the goal of finishing the sampler quilt. Jelly Roll Rugs are quite the trend right now and so much fun to make! All you need is a jelly roll or some of your stash to make strips from; however, the Jelly Roll is much more convenient! Construction is simple straight stitching and zig-zagging, but there are some tricks to being successful! You can make rugs to go in any room and match any decor. Rugs are machine washable and get softer the more they are laundered! Take this two part class and make yours today. A make-up bag, sewing bag, swap bag or just a bag perfect for any sewing retreat. This bag is easy to make and holds a lot of goodies! The frame on this bag creates an opening that stays open no matter what, making it both handy and professional looking. Are you using your embroidery machine to its full advantage? Join us and spend a day finishing a quilt in your hoop and see how easy it is to finish projects on your domestic machine. The Easy-Connect Quilting files and technique allow you to use your home embroidery machine to get quilting results like you'd see from a long-arm quilter. Edge-to-Edge Quilting on Your Embroidery Machine includes instructions for the Easy-Connect Quilting technique, the embroidery files needed to stitch out 10 quilting designs, and the Baby Sew Fast quilt pattern -- a project that's a great size for perfecting technique. Tool Tote is what everyone needs! The bag everyone WANTS! Pockets all the way around on the outside, pockets all the way around on the inside! Heavy duty metal stays that keep the bag's mouth wide open, easy to reach in and find all your important tools. Tools are not the only things it's good for - there are many other uses for this versatile tote. This is a beginner class. In just eight three-hour classes, you will successfully finish your first quilt. In class, you'll learn to machine piece, master half square triangles, apply borders and binding as well as quilting techniques. Participants will each receive a handbook with complete directions for each class and will pick out the fabric of their choice. $150 +material & supplies, 10% discount on material & supplies. Space is limited so call and sign up today!